Spooky Halloween? Or elegant Halloween? I tend to lean towards the elegant side for sure. 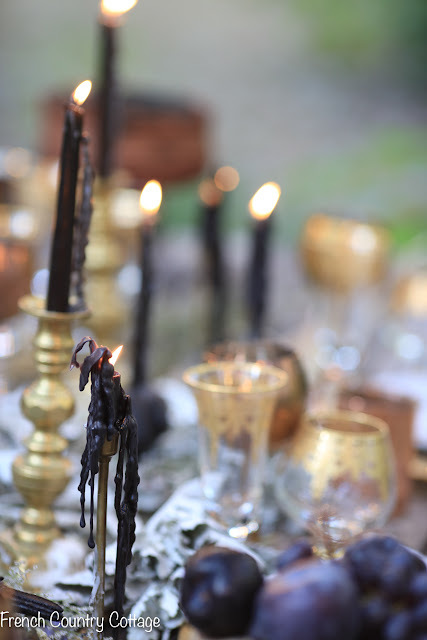 but today... it is all about a moody elegant table setting. 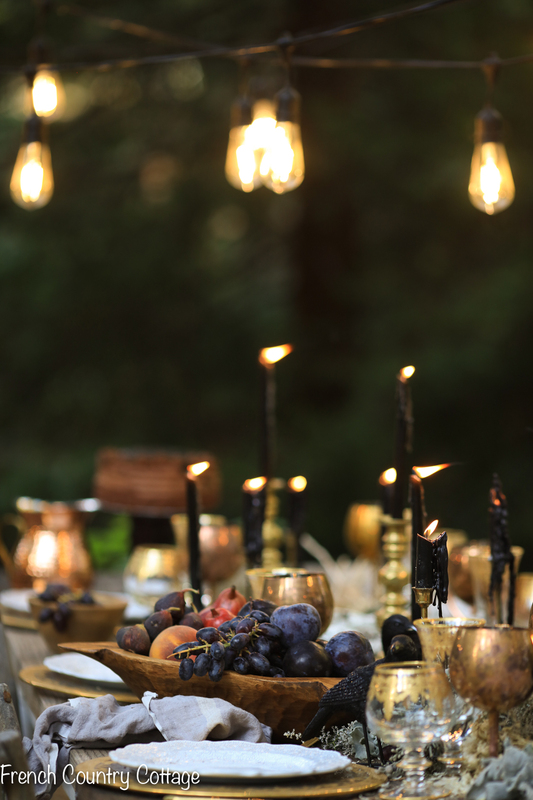 I started out thinking about setting a simple halloween table. but in a subtle way. And some glam elements as well- like those gilded candlesticks, goblets and chargers. and down the center of the table it was nothing but simple. And added a few ravens for a touch of spooky. for a bit of deliciousness in the decor. 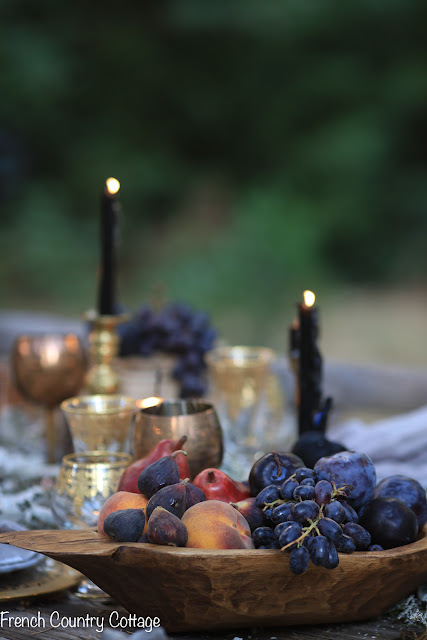 A simple not so spooky and a little bit elegant halloween table. So excited to be joining these friends who are sharing a peek at their halloween decor today. This is all so beautiful, I can hardly stand it! 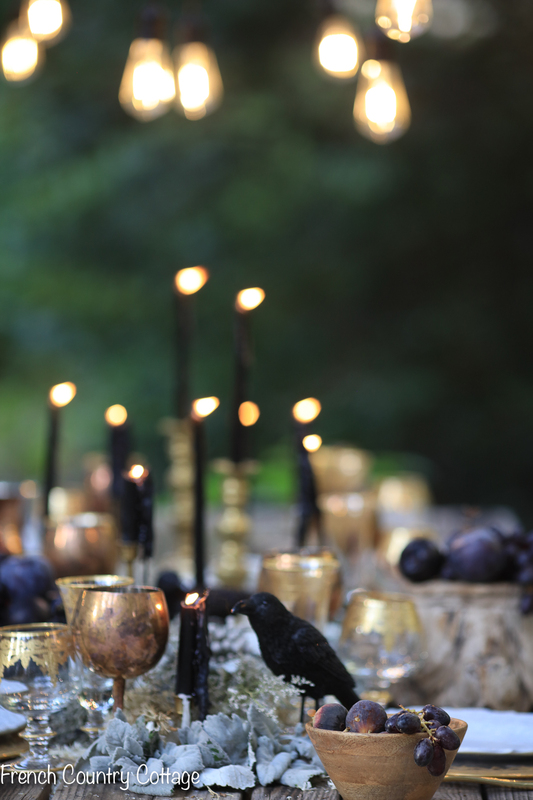 I love all the rich, deep colors, and eerie lights of the dripping candles. Just beautiful!! You create and capture things so beautiful. This is pure magic! 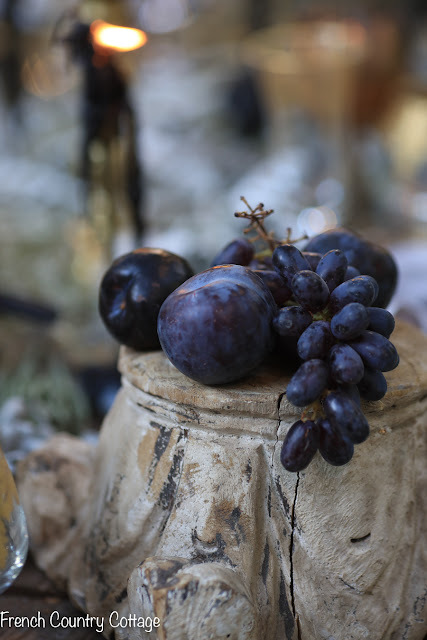 So gorgeous and rich, and the dark fruit makes it stunning! Thanks for all the wonderful ideas! 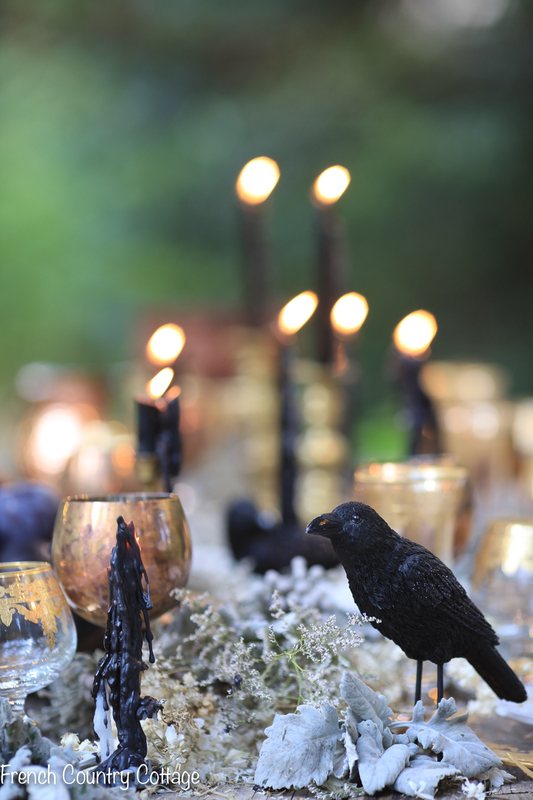 This is so rustic and beautiful, the black candles makes the setting more spooky... I love it! 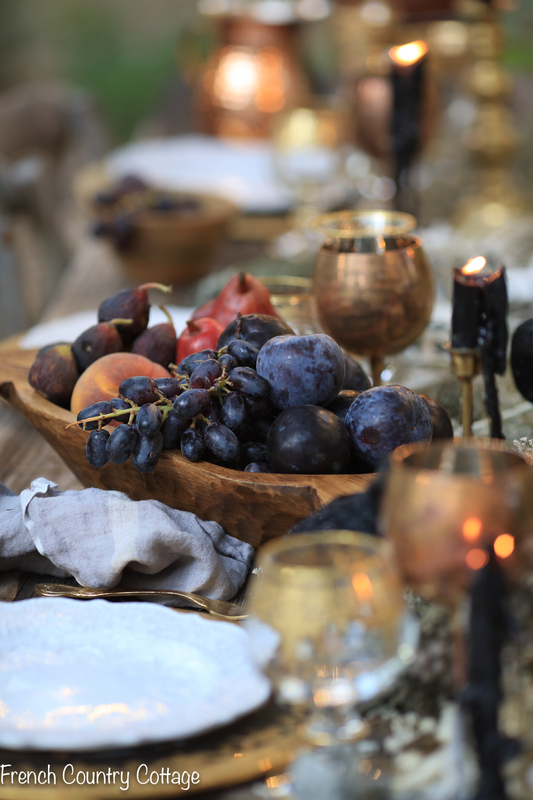 The dark plums and grapes mixed with the copper and brass is stunning. 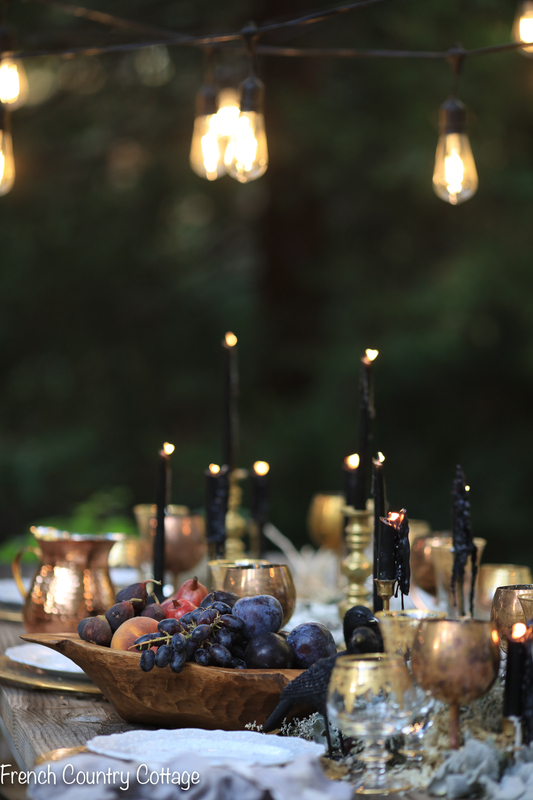 What a elegant, spooky table for celebrating the bewitching hour. Lovely! That dark elegance is just perfect, and your photos are beautiful! Who knew Halloween could look so gorgeous? Seriously, this is stunning! Courtney, this is wonderful. I love that it's elegant, stylish and opulent. LOVE the mix of old, new and a few ravens. LOVE Halloween! Courtney, this looks like something out of a Dutch master's still life! Just breathtaking!